Your order will ship MONDAY if placed in the next 2 hours 59 minutes . Enter your shipping address zip code to receive an instant delivery date estimate from UPS. Remington UMC 223 Remington Ammo 62 Grain Closed Tip Flat Base ammo for sale online at cheap discount prices with free shipping available on bulk 223 Remington ammunition only at our online store TargetSportsUSA.com. Target Sports USA carries the entire line of Remington ammunition for sale online with free shipping on bulk ammo including this Remington UMC 223 Remington Ammo 62 Grain Closed Tip Flat Base. Remington UMC 223 Remington Ammo 62 Grain Closed Tip Flat Base ammo review offers the following information; Remington UMC 223 Remington ammo feature 62 Grain Closed Tip Flat Base bullets. Remington Ammunition presents the shooter with an extensive variety of premium bullet developed to combine with the strict manufacturing tolerances to create ammo with which any shooter would be willing to take the perfect shot. With a muzzle velocity of 3100 feet per second and muzzle energy of 1323 feet pounds making the Remington UMC 223 Remington an outstanding choice for practice shooting, target shooting, and plinking ammo. Remington UMC 223 Remington ammo is new production, non corrosive, reloadable, and features brass casing and Boxer primers. Remington has been a trusted brand for years when it comes to the production of good quality bullets at economical prices. Remington ammo is produced mostly for those shooters looking to go hunting. With the perfect ammo bullets for each caliber of centerfire rifles, rimfire, shotguns, UMC, and pistols and revolvers. The UMC division makes only first-quality product, in a limited line of popular specifications, so they can bring you the benefit of manufacturing efficiencies that keep costs low. The rifle and handgun ammunition made today is the product of 140 years of design innovation and manufacturing excellence. Whether for practice, target shooting or training exercises, UMC ammunition is a superb choice for high volume shooting and hunting. Use this Remington 223 ammo for pig hunting. Love the accuracy and power. Satisfied with this Remington UMC ammo! Remington ammunition for sale online at cheap discount prices and free shipping available at Target Sports USA. We carry the entire line of Remington ammo for sale including Remington Handgun ammo, Remington Rifle & Shotgun ammo, as well as Remington 22LR ammo and Remington 22 WMR ammo. Ammo made by Remington offers high quality components and consistent reliability that has been proven. 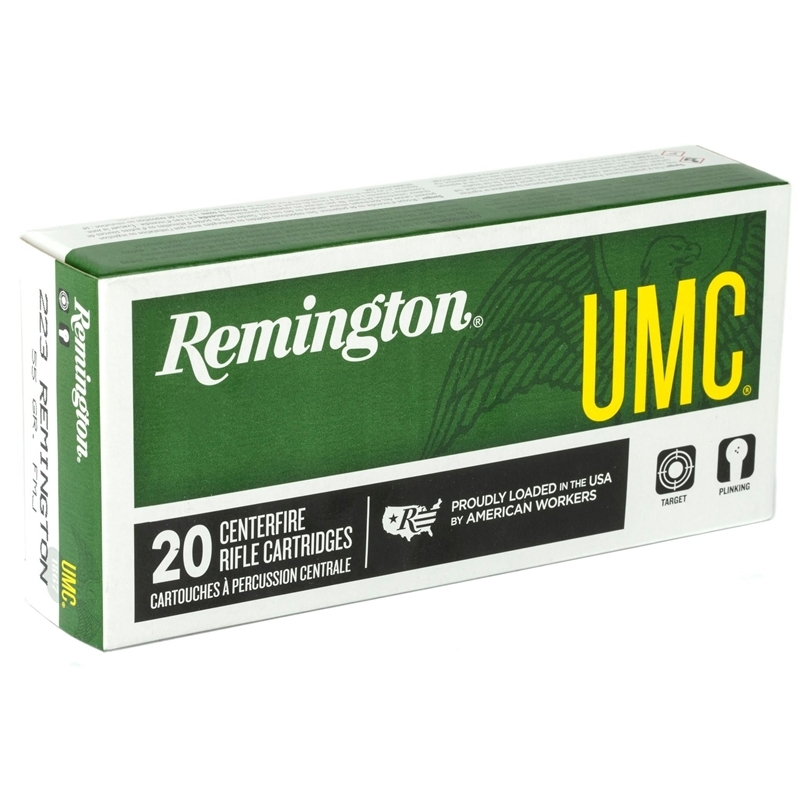 To lead the ammo market, Remington has developed several different ammo lines such as Remington UMC ammo which offers target and practice ammunition in calibers such as 223 Remington ammo, 308 Winchester ammo, 9mm ammo, 380 ACP AUTO ammo, 45 ACP AUTO ammo, Remington 40 S&W and many other popular calibers. For hunters and small game purposes Remington offers an ammunition line called Remington Express Ammunition. The Express ammo line features a Core-Lokt bullet which delivers great performance for small game and varmint hunters. he thin copper jacket is electrolytically plated to the lead core for near-perfect concentricity and gyroscopic balance. Only Remington ammo and few others offer a ammunition line for those who wished for lower recoil, called Managed Recoil ammo by Remington. Developed by Remington ammo, it features up to 50% less recoil then conventional ammunition. Managed Recoil ammunition offers half the recoil and twice the performance. TargetSportsUSA.com also carries the newest lines of Remington ammunition for sale such us Remington HTP Handgun ammunition, Remington Ultimate Home Defense ammo, Remington Golden Saber ammo and many others.